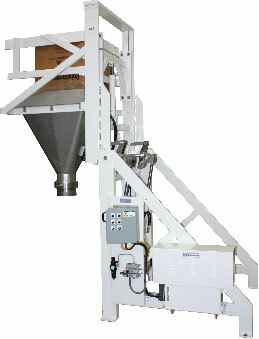 Unit seals container of cheese powder to pour hood, inverts container and discharges contents at 60” above ground level. Manual stainless steel butterfly valve on pour hood outlet. 2” diameter chrome plated pivot shaft mounted in heavy-duty spherical bearings. 5 GPM Parker hydraulic system with MTS exclusive two-speed operation for smooth, controlled rotation of the pivot carriage.